Four-time Chinese national champion Zijun Li performs her free skate at the 2015 World Figure Skating Championships. The 2014-15 season was not set up to be an easy year for China’s Zijun Li, who found herself without a head coach for the entire summer. After the Olympic season ended, the contract between Mingzhu Li and the Chinese national figure skating team ended. As a result, the skater’s new programs were prepared late which somewhat impacted her early season performance. 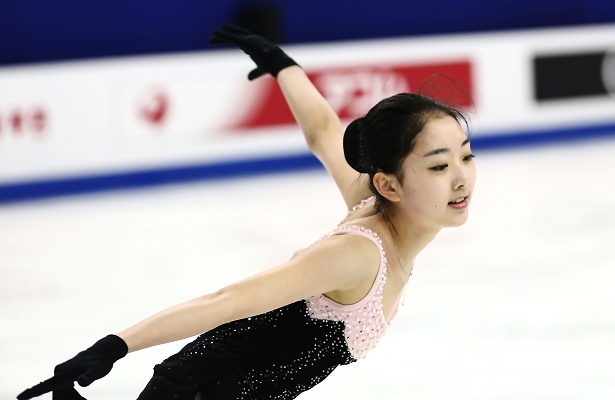 During the Grand Prix series, Li finished sixth at Cup of China and seventh at NHK Trophy. Skating fans in China were beginning to worry if it would be another disappointing season like the previous one when Li went through a growth spurt. It wasn’t until October of this season that she began training under Haijun Gao. After six months of training under Gao, the 2014 Four Continents bronze medalist feels that she has learned more mentally than technically. As Li grew more adapted to the new training environment, she began to get back on track. In December, the skater from Beijing claimed her fourth national title and followed up with a fifth place finish at the 2015 Four Continents in February, where she was visually emotional after her free skate. Li needed this momentum going into the 2015 World Figure Skating Championships, which were being held in her home country for the first time. Li started the event with a good short program, finishing sixth with a score of 61.83. The only flaw was an underrotated jump on the back end of a triple flip-triple toe. However, her free skate fell apart and she finished 11th in that segment and ninth overall. This is not unfamiliar territory for many athletes, and Li knows this. Li has been working with Lori Nichol for the past three years, and feels that the choreographer not only understands her style well, but is very encouraging and supportive. While the skater doesn’t have any details on the new long program, she feels she is more suited to music at a certain tempo, especially in triple metre. In addition to musical choices, Li will be making some tough calls on technical elements for the upcoming season. However, to help balance the scales, the skater intends on raising the level of difficulty of other jumps. If the plan is executed, that will be something never seen from Li, who used a triple flip-triple toe and triple Salchow-double toe this past season. Nevertheless, the skater plans to make improvements step by step. After finishing seventh at the 2013 World Championships two years ago, followed by two tough seasons, Li aims at a strong comeback.